Krishnan Suthanthiran was born in Southern India. As a young man, he moved to Canada to attend Carleton University in Ottawa, Ontario. After completing his masters in Mechanical Engineering, he took pre-med courses at the University of Toronto and worked for an oncologist in the U.S.A. In 1977, he founded Virginia-based Best Medical International, and over the past 38 years has grown Best and its affiliated companies into major manufacturers and distributors of health care products globally. 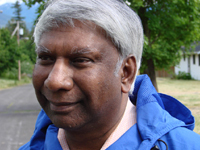 Today, Mr. Suthanthiran has business interests in a wide variety of industries throughout North America and Europe, including a purchase of the entire town of Kitsault in Northern BC... which, of course, is exactly what this web site is dedicated to. CBC Reporter Chris Brown takes a tour of BC's perfectly preserved ghost town, but as he finds out there are plans to bring it back to life. On January 8th, 2013, Kitsault Resorts announced the plan of establishing an LNG plant, refinery, and export terminal in Kitsault, BC. The proposed facility will provide export of energy products and pipelines will be established for oil, natural gas, and refined petroleum products that will travel to Kitsault from Alberta as well as from Northeastern British Columbia. These products will be shipped to Asia and other high demand markets. This project is estimated to cost $20 to $30 Billion CAD/USD. We will be working with a consortium of energy producers, governments, customers, engineering firms, investors, First Nations, and others to accomplish these goals. For your convenience we have published an online book and brochure about the town of Kitsault, both written by Dr. Norma Kerby. The book may be downloaded in PDF Format or as a Flip-book (SWF). Click here to download the brochure (PDF). If unable to open the above documents, Click here to download Adobe Reader or Click here to get Adobe Shockwave. Many of you are familiar with the town of Kitsault's unique history. In 2005, Krishnan Suthanthiran, a Canadian educated U.S. business man and philanthropist, saw great potential in this sleeping beauty of a town and decided to purchase it. He has since been working diligently to awaken Kitsault from its deep sleep and bring it back to life. Krishnan has renamed the town Chandra Krishnan Kitsault in honour of his mother: "My mother gave me life and I want to give life back to this town." Those of you keen to learn more about Kitsault will be happy to hear that you can now watch the whole story from the comfort of your home. The Best of Kitsault is a 90 minute DVD that covers the history of the town from its early days to the present and includes an interview with the town's present owner, Krishnan Suthanthiran. The Best of Kitsault features stunning aerial vistas of the B.C. coastline and pristine wilderness of the Nass River Valley. You will see for yourself why Kitsault has been called "Heaven on Earth!" The cost of the DVD is $23.95, plus shipping & handling (+ applicable taxes). This collector's item will be a treasured souvenir documenting the development of this unique town. Click here for videos and still images of the town.